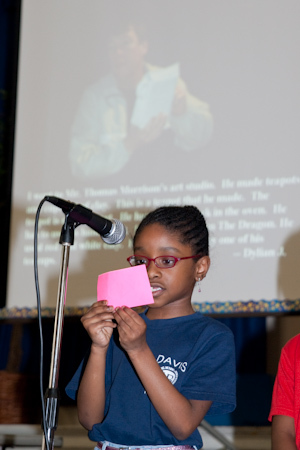 Davis Magnet School second graders presented their Davis on the Map photographs in a narrated slide show. Each student read the caption he or she wrote to accompany a photograph. The students visited six places in the neighborhood with their cameras: The Commons at Eudora Welty’s Birthplace; Two Sisters Kitchen; The state Supreme Court; Wishbone Art Studios; Pigott, Reeves, Johnson; and the We Will Go Ministry. You can read about the process in recent posts here. In the next few days, I’ll be putting all the selected photographs on my website. This is our second year with the Davis on the Map project. We developed it last year through an initiative of Parents for Public Schools of Jackson. We refined the project his year. One of the best things we did differently was to create a mini computer lab in the classroom using the school’s four laptops (plus one that was a personal laptop). Trying to use networked computers in the library the previous year was slow and frustrating. Here are some McLeod Elementary School fifth graders working on titles and captions for their photographs of living things in the schoolyard. We had a few computers freeze up on us while we worked, but generally speaking we could get at least six computers to cooperate at a time. The most challenging thing about working with schools and digital photography is the computers. For It’s Alive, we had a hard time getting (computer) permission to save photo files to school computers. 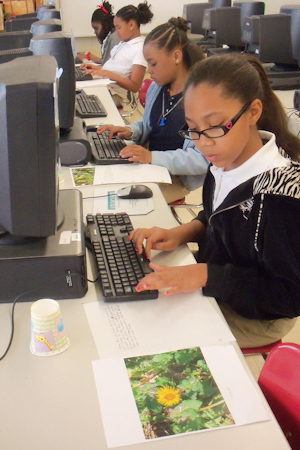 With a large district like Jackson Public Schools, permission to save files on networked computers has to come from the Instructional Technology Department. We filled out a ticket to get permission and, eventually, we got what we needed, but it was a difficult process. All of us who have kids in JPS schools and/or are involved in educational projects are really pulling for the promised federal stimulus money to come through. It’ll mean lots of new technology, including smart boards and laptop carts for classrooms. We got a shout-out at Kid Tested, Librarian Approved. Want to learn how to write accessible and interesting nonfiction for the emerging reader? Sit yourself down in front of this book and take notes.” That’s very nice. I love the McLeod photo.